After centuries of second-class status, women crashed into the twentieth century with new verve. 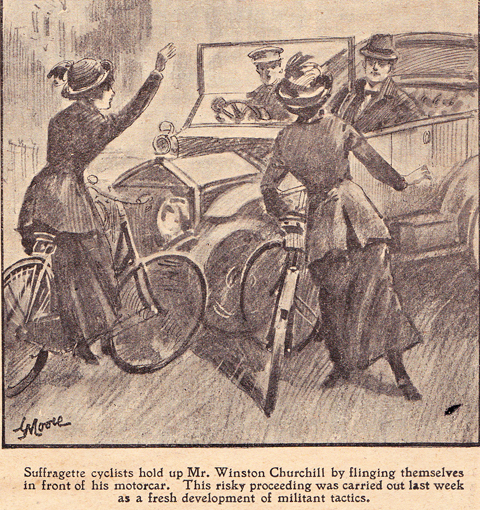 Women cyclists were among the first activists to promote ‘rational dress’ that did not impede movement. And Victorian feminists had battled to become doctors, attend university, and gain basic property rights, although they were still far from winning the vote. Over a century later, we generally take bicycles for granted. 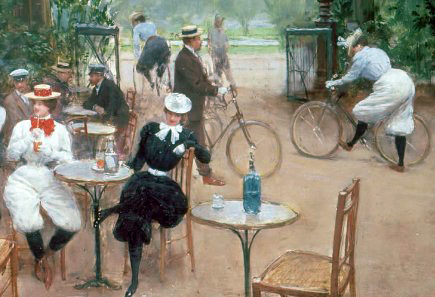 But a hundred years ago the bicycle represented more than just a means of getting from A to B, particularly for women. It made available for the first time a relatively inexpensive form of independent transport. Interviewed in New York World in 1896, Susan B. Anthony declared that bicycling had ‘done more to emancipate women than anything else in the world.’ Previously, women had had some difficulty to travel alone, let alone to own their own means of transportation. Though, at first, bicycles were expensive, and were also large machines unsuited to female riding, by the 1920s working class people could at last own their own vehicle. And women could ride on their own, without male supervision. A major issue with female cycling was clothing. Cycling required a more practical, rational form of dress for women. To the disgust of the prevailing conservative society, large billowing skirts and corsets started to give way to bloomers* – baggy trousers, sometimes called a divided skirt, cinched at the knee. The battle over dress reform, largely fought on the battlefield of cycling attire, and the popularity of cycling among women, forever altered public perceptions of female athleticism and proper female behavior. 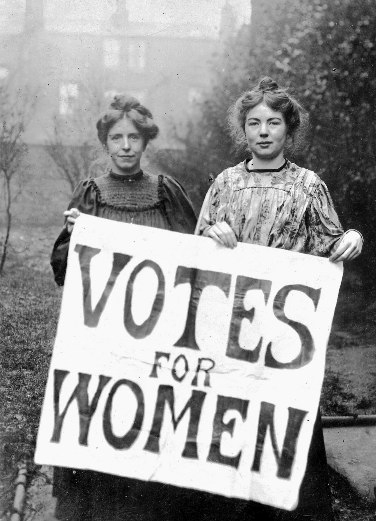 With the founding of the Women’s Social and Political Union in 1903, the Suffragettes were born and the ‘Votes for Women’ fight began in earnest. In February 1907, the National Union of Women’s Suffrage Societies led by Millicent Garrett Fawcett, organized its first national demonstration, which became known as the ‘Mud March.’ At a demonstration a week later, more than 700 suffragettes made two vain attempts to force entry into the Houses of Parliament. Mounted police were called out to deal with the riot. 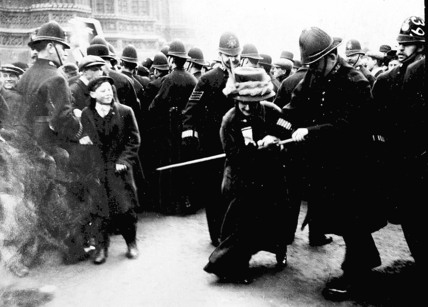 Among the sixty-seven women arrested was Emmeline Pankhurst, who served fourteen days in Holloway Prison. By 1910, demonstrations had become more militant. Initially, the amount of damage the suffragettes inflicted was negligible, but the forcible feeding to which hunger-strikers in prison were subjected changed the temper of the movement, so that more extreme measures became acceptable. Stone-throwing was introduced. At the start of this activity, the stones were usually wrapped in paper, to avoid injuring anyone accidentally. Sometimes, in addition, they were attached to string, the end of which was held by the thrower. It is difficult to imagine anyone but a middle-class Englishwoman resorting to such a procedure. BLACK FRIDAY: 18th November, 1910 – later known as Black Friday – was a turning point. Following the failure of the first Conciliation Bill, there were violent clashes outside parliament. Suffragettes trying to reach parliament were treated particularly violently by roughs in the crowd and police who had orders to push them back. 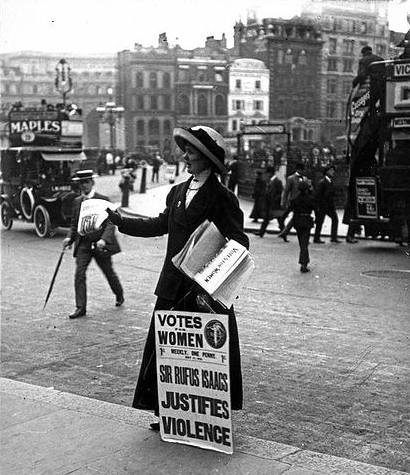 One suffragette, Ellen Pitfield, later died from her injuries. The events of Black Friday were a public relations disaster for the government: the press took the side of the Suffragettes, printing pictures of police assaulting unarmed female protesters. The actions of the police were greatly criticized. After the outbreak of War in 1915, women were soon desperately needed to do the work left vacant by enlisted men. Attitudes were bound to change. 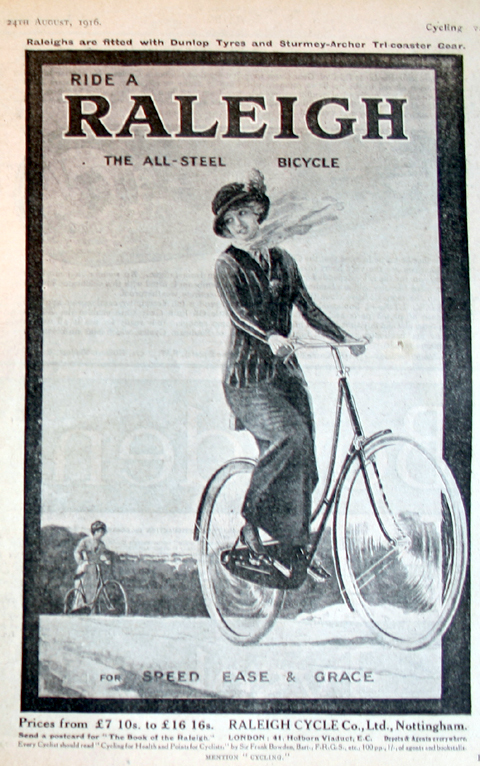 By 1916, as seen in the advert below, women were able to ride a Raleigh bicycle with speed, ease and grace.